After a long day at Autocross, I helped my friend Chris bring home his electric motorcycle. 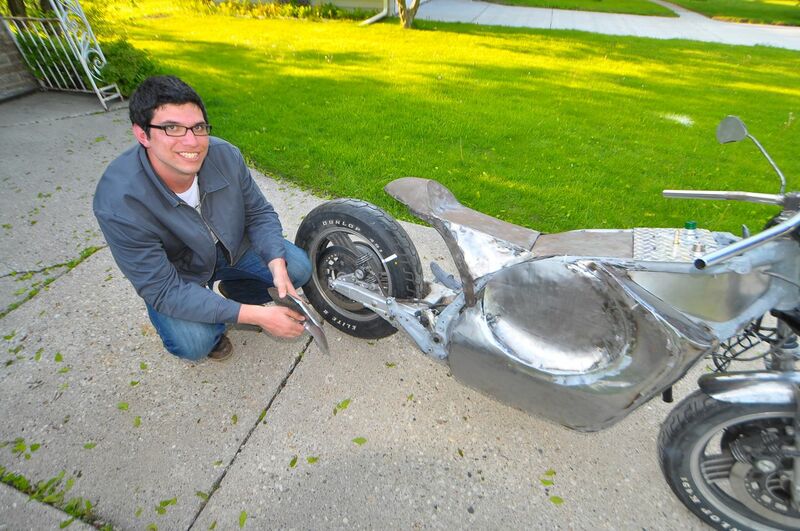 He had it at an art metals class, where students used the cycle as a project for designing real-world motorcycle parts. In this case they sculpted a metal body for the bike. My favorite way to move an EV cycle is to simply DRIVE it straight up a ramp into the back of a pickup truck. (Gotta love PWM!) Unfortunately, the cycle had all the batteries in it, but NO controller. Heavy, NON-self-propelled cycles are a little harder to move. Fortunately, the school had a hydraulic lift to simply raise the cycle to my tailgate height. Once we got back to Chris’ place, we just carefully backed the cycle down a plank off the back of my truck. Then we snapped a few photos of the bike in his driveway. The plan now is to use the metal body as a template to create a fiberglass body from. Fiberglass will be much lighter (and NON-Conductive!) The fiberglass can also have a colored gel-coat applied when making it to have a fantastic paint job. Neither Chris or I have done any fiberglass work before, but both of us are interested. We are also members of Milwaukee Makerspace, a tool co-op and cool place to work on projects and learn fabrication skills. Some of the other guys should be able to help us out with the fiberglass production. Next post: Perpetual Motion Solved! Regen Alternator.